Students visit the library once a week with their class. At this time, they will return and check out books, listen to a story, participate in the follow-up discussion, practice library skills and participate in any activities/contests currently being held in the library. Students may also take Accelerated Reader quizzes and use the computers for any school-related projects. 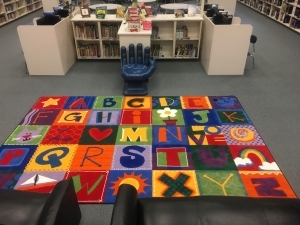 Students are expected to be respectful and courteous to one another, the library staff, library materials and furnishings. Books are due back the following week during library time. Books must be returned in order to check out new books. Students are responsible for their books. We understand that accidents happen. The student is responsible for informing the library staff should such a situation arise and, if necessary, pay to replace the book. If a book should be lost or damaged while in a student’s care, borrowing privileges may be withheld until the book is paid for in full. Why Should We Read Aloud to our Children? As parents, we play a critical part not only in helping our children learn to read but also in fostering a lifetime of reading. Reading is how we discover new things. Books, magazines and the internet are wonderful learning tools but without the ability read, they are not much use to us. As a reader, we can educate ourselves. We live in the information age but we need to know how to read to take advantage of all the information that is out there. We need to be able to read to function in our day to day lives. There are job applications to fill out, medical instructions to follow, reports and memos, map directions – just to name a few. Reading aloud provides a model for pronunciation, develops vocabulary, and strengthens our children’s social skills in a fun way. Reading aloud also teaches our children to listen. We all know that children love to talk but being a good listener is just as important. Reading also provides us with the opportunity to bond with our children while having a wonderful time. The more enjoyable reading is, the more they will want to spend their time reading. The more time our children spend reading, the better they become at reading. 1. Take a trip to the library and choose the books together. 2. Give the title and author before you begin. 3. Read with feeling, make gestures, and incorporate sounds. The more we get into the story, the more excited our children become. 4. Stop at an interesting part of the story and talk about what is happening. 5. Ask questions. What do you predict will happen next? How is the main character feeling at this part of the story? What would you do? 6. If the book is challenging – take turns reading pages. There is no reason for our children to struggle for a long time on a word. It’s acceptable to step in after a moment. We want reading to be fun, not frustrating. Once our children learn to read on their own we are prone to stop reading to them. Our lives are so busy. I can tell you that even our 4th graders love to listen to a story. Keep reading to them! As they get older, take turns reading the pages. Share one of your favorite childhood stories. Instilling a love of reading is one of the best gifts we can give our children.